When Haron bin Mohammed from Muar/Batu Pahat married my sister Maznah in 1965, my Mak instructed us to refer to him as Abang Long, shortened to Bang Long because my sister is the anak sulung, the first born. He is the only "Abang" we have in our family. As for Iain, he always refers to Haron, his brother-in-law, as "my abang from Batu Pahat" . 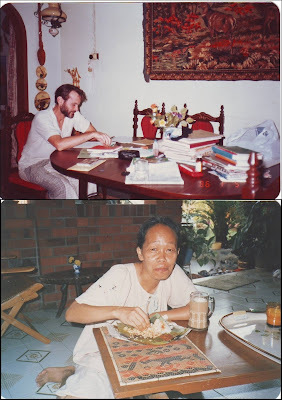 We were so at home in their Jalan Jengkeng house whenever we popped in from Leicester (from the mid Eighties to 2007) to spend time with my mother and the rest of the clan. Iain enjoyed going over Hidayah's school books and Ash gets busy scoffing a packet of nasi lemak which Bang Long bought every morning from the warong nearby. And in those days Bang Long's wife makes super-duper teh tarik! But back to Bang Long. It's often said that a man (or woman) is made up of more than the sum of its parts. I shall begin by annotating the parts of this recent octogenarian - this retired teacher, community worker, gardener, DIY plumber, curtain stitcher, world traveller (Scotland, Spain, China ... ), and above all husband, father, grandfather....and beloved abang. 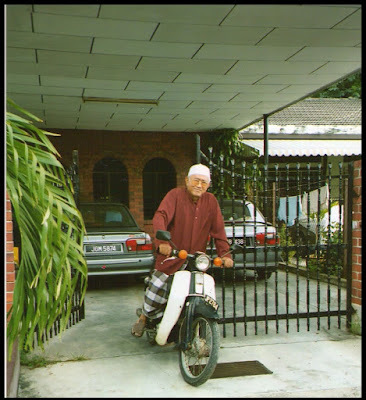 I recall the first time I met this man - who was to be my sister's husband - when he came to our kampung house at Pasir Panjang to meet his future father-in-law. I don't think I have ever seen such a nervous scaredy cat! Even his voice trembled when he spoke to my Abah. 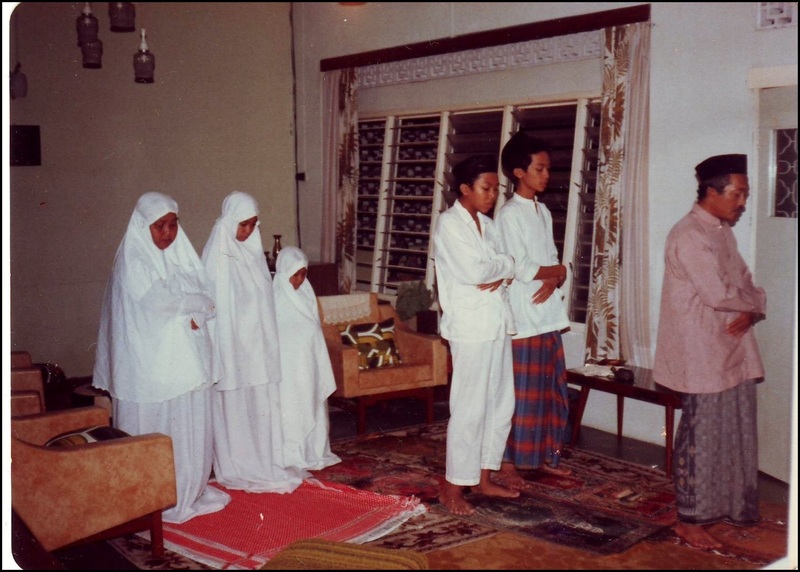 It all went fine and Haron bin Mohammed became a full-fledged member of Abdul Hamid's family. But that was not all. For the two sisters and their lesser (?) better(?) halves there were several travels and adventures to share - three times in England, in Scotland, in Wales and in Spain. Adventure 1 - Tobermory, Mull - 2000(?) - This is a pictorial version. The details are too gruesome to be recorded. The journey, by ferry from Oban to Tobermory. Note the village of Dervaig to the west of Tobermory. Haron's wife had to be pushed and shoved onto the ferry because she has an irrational fear of sea travel. Nitwit!!! Beautiful Tobermory. Note the row of houses at the harbour. Where we stayed at Tobermory. Our room is within the green box. What our room looked like. On that chair (within the square) I watched the man from Muar looking out from the window, savouring the beautiful peace of Tobermory harbour at night. On that trip, Iain took us for a drive to Dervaig. On the way, the car broke down (the wishbone snapped). He hitched a ride back to Tobermory to get a mechanic. The three of us waited by the car and soon we were surrounded by Isle of Mull natives, all very suspicious of these strange outsiders hanging around a deserted road in the middle of nowhere. Adventure 2 - Hadrian's Wall. From Scotland the intrepid four continued their journey to visit Hadrian's Wall in Northumberland. As our driver and guide was a typical Scot, he made sure we boarded at places where we could get our money's worth and that meant Youth Hostels. We never grumbled about that - it's very sensible. Sometimes we got to stay in grand old houses (the Loch Lomond youth hostel was a huge stately home that belonged to a Scottish tobacco baron) and in the most picturesque locations. We did our own cooking and dined in lovely oldie-worldie rooms. Remember the dining room at Oban Youth Hostel? There was a table for 4, with a lovely view overlooking the sea. We made the lads chope (reserve) the table while the lasses got on with the cooking. Very kiasu but it didn't work all of the time. Some German tourists got there before we could. ............ at the Once Brewed Youth Hostel. We drove back and forth along this B road looking for the Hostel. We kept on discovering the sign for the village Twice Brewed but no Once Brewed! Tempers were getting frayed in the car - we were all trying to be the driver (except my diplomatic sister), while the driver himself was getting more and more agitated. Well, while doing this posting, I discovered the reason - it all boils down to a peculiar English idiosyncrasy - the desire to keep foreigners confused. You see,"Once Brewed is also known as Twice Brewed. If you drive the B6138 from the east you will see the village name "Once Brewed" "... while those coming from the west will see the name "Twice Brewed" So naturally, when the driver misses the Twice Brewed roadsign and turns back, he will only see the sign for Once Brewed. And he will be terribly confused. So we can't blame the driver's sense of direction. 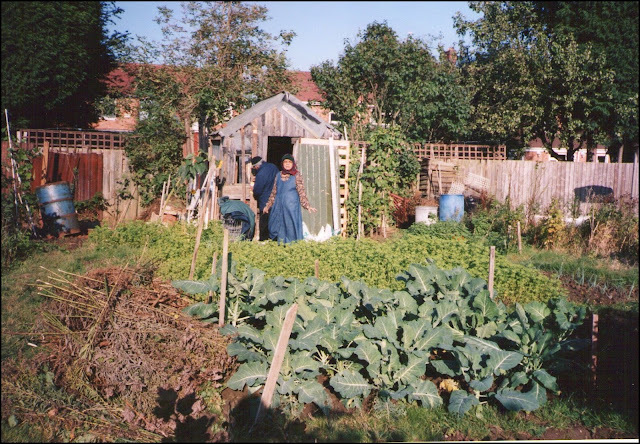 Back in Leicester, we got you working for your supper at Iain's allotment. As you both were such keen gardeners, that morning gave you much more joy than shopping at the City Centre. You both did plenty of digging: Maznah had the joy of lifting the freshest potatoes she's ever seen (the potatoes are just behind the broccoli in the picture). But she had to contain Bang Long's desire to repair Iain's shed - he's a DIY fanatic. Adventure 4 - Two pensioners behaving badly on Sept 28 2002. I almost forgot : when the two of you participated in the 400,000 strong Anti-War Protest in London. Remember when you both were resting with your placards at Piccadilly Circus? You were surrounded by cameramen snapping your photographs - they were quite taken by this elderly Muslim couple who took the time and the effort to demonstrate their stand against the War on Iraq. I guess there must be many pictures of you two somewhere in the ether. Aaah, two celebrities from Malaysia!!! We had loads more adventures, like the salt in the tea instead of sugar and how we had to have the leftover nasi lemak from breakfast for dinner because someone forgot to pack the tin opener!! But I shall leave all those other memories for you to share with your children and grandchildren. 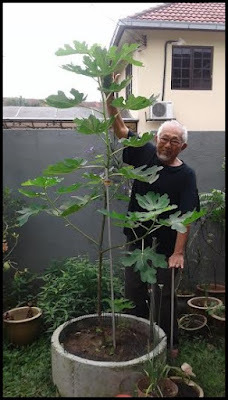 Bang Long, at the beginning of your eighth decade we want to jot down how much you have achieved in your time - to capture the total sum of this Muar man - not just the isolated parts. You (and Maznah) were great parents. A humble couple from humble beginnings, you were adamant that your children should not turn into kacang lupakan kulit. Before Maria left for university in Liverpool, she was told "Ingat, kau 'tu hanya anak cikgu", and she has kept true to your reminder. When Mahzan, who was then ( late 1980s) a medical undergraduate at UM, went to the NUS Hospital to see to his Tok Mok, he noticed an old lady in pain and looking worried. He went over to her bedside to console her and it helped her no end. You brought them up to give of their best - for both this world and the hereafter. Photo by Iain - before he became a fully paid-up member of the family. They were always made aware that it was duit rakyat that got them to where they are. If there's any one image of you that we can recall with fondness, it is this. 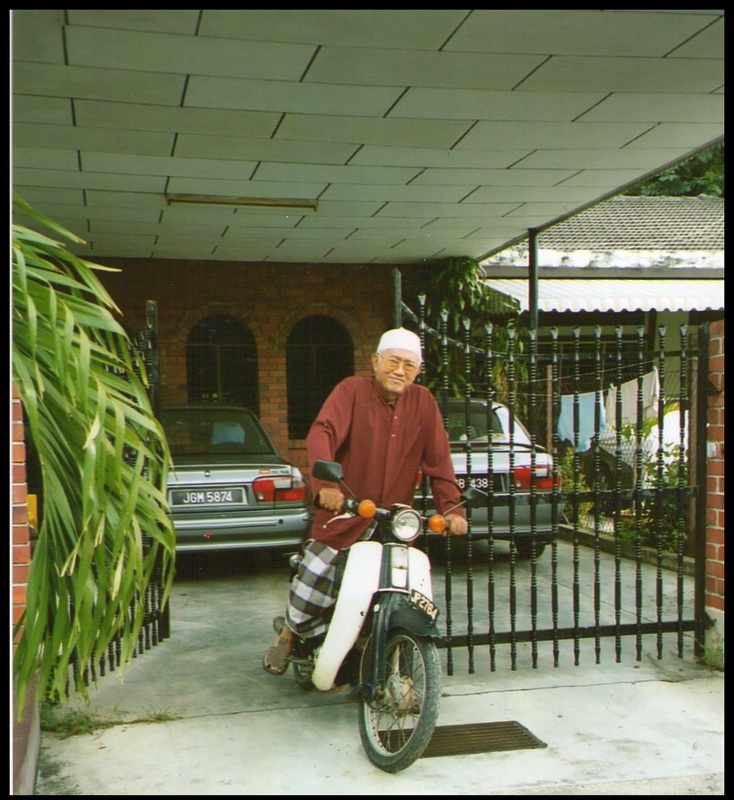 Haji Harun on his trusty motorbike - on his way to the surau. And so, when Iain did his book Fatimah's Kampung - he included you on page 72-73. 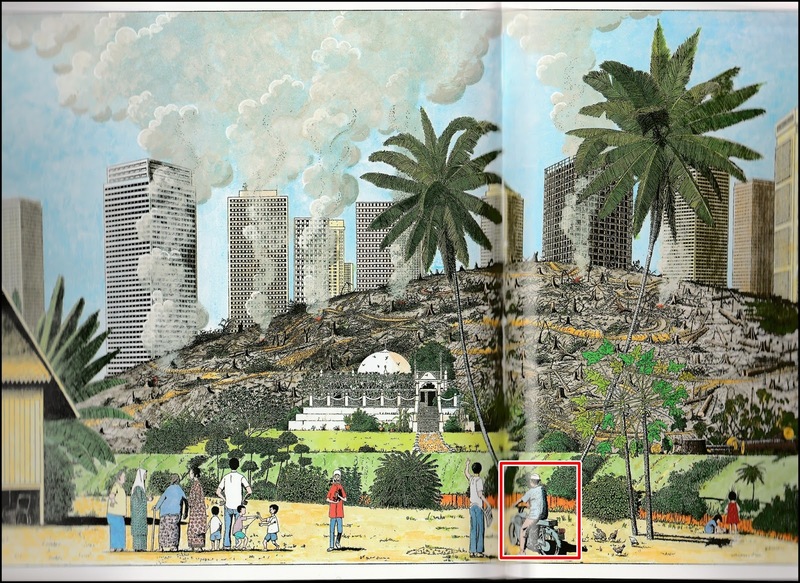 Haron gazing at the destruction of our world - both physically and metaphorically. I guess that's all I can say. Many Happy Returns Bang Long from your two weird in-laws. Thank you for sharing your time with us and for understanding and accepting our foibles and inadequacies. I remember how you like Effendy. This song was recorded many, many years ago from vinyl to cassette. Three years ago I decided to transfer it to a video and here's my crummy handy work for you to enjoy and cry over. I shall begin with an apology. We old geezers are prone to repeating ourselves; with our stories and experiences. 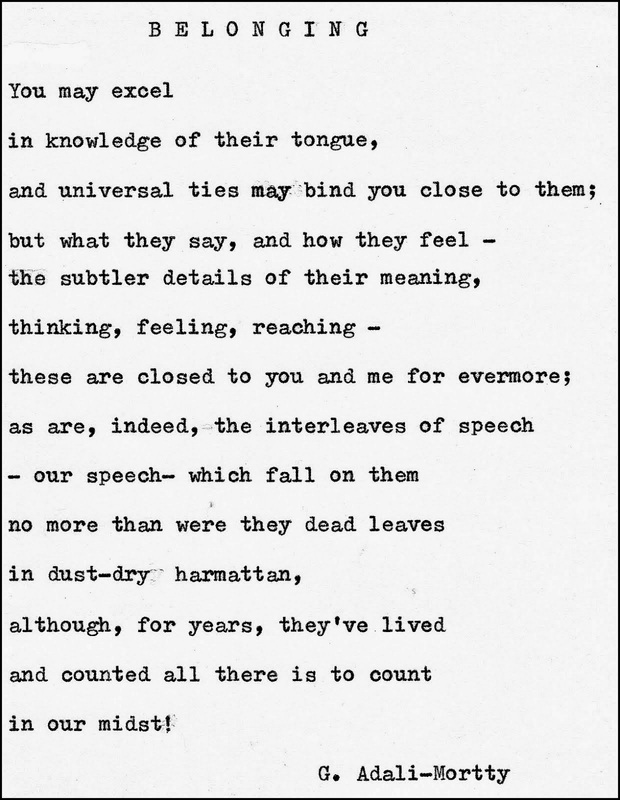 We are inclined to slide into reminiscences, beginning with "Aaah, I remember the time when I ... blah, blah, blah ........." and we fail to see the faces with their eyes rolled up and the silent voices saying, "Here we go again." However, it's not my intention to foist upon my readers the tales of past times and old writings. The trouble is, man's bigotry and ignorance tend to echo the sins and stupidity of their forefathers ; from one generation to the next. And so you get the same old replay - with the codgers and the whippersnappers, the eminences and the hoi polloi at loggerheads over the same old bile and prejudices. The case of Cameron is a re-run of the old scenario, with the younger regurgitating their foréfathers' contempt of others not of their ilk, and spouting the same cultural and political bigotry. Old wine in new bottles. For this part of the AAF (Anglo-American Fetish) I cannot add any new revelation about the mouthings of the present PM of Great Britain. They will be merely repetitions and extensions of the old Islamophobe chestnut that his progenitors expounded on. There is, for example, the legacy of their hero and national pride like Sir Winston Churchill. There's also the four times British Prime Minister William Gladstone (1809-1898) who called the Quran an "accursed book" and held it up during a session in Parliament, saying: " So long as there is this book there will be no peace in the world." I suppose one could find excuses for such contempt: those were different times, an era when white Christian Britannia ruled the waves. We cannot expect them to know better! We are well aware of right-wing extremists in UK like the BNP and others. And this list is only partial - think, for example, of LibertyGB and the English Defence League. Such groups may be variously categorized as nationalists, far-right, white supremacists, hard-right, radical right, fascist right, ultra-right, xenophobic - and they target (so the pundits say) foreigners, coloureds, blacks and Jews. We are bombarded with terms like Islamists, jihadists, Muslim extremists, Islamo-fascists in the print and electronic media. However the label religious/Christianist Extremists hardly ever sticks to white (and non-white) Christian affiliated groups - Anders Brevik, for example, and the Klu Klux Klan are merely lone rangers and aberrations of white/Christian culture. 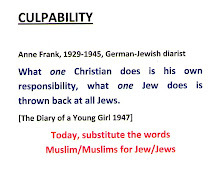 Christianity is likewise absolved of ungodly practices like slavery, the Holocaust, apartheid and imperialism. Feed your eyes on these images of the Right Wing Christian Extremists "Britain First". Note the non-white participant - a genuine True Brit. Britain First is also reported by Channel 4 - A bona fide mainstream news channel. If ISIS are breeding an international group of followers - so is this German anti-Islam Fascist mob Pegida. Pegida = the Patriotic Europeans Against the Islamisation of the Occident. They are quite a hallowed lot ranging from Saints, Presidents, philosophers, novelists, Prime Ministers, and some women too! Here are some names you can throw into the hat : Theodore Roosevelt, St Thomas Aquinas, Bertrand Russell, Stephen Harper, Ayaan Hirsi Ali, Wole Soyinka, Francois Gautier, Taslima Nasreen, Narendra Modi, Naipaul and Rushdie and of course Trump and Cameron. ...... or else .... get out of Britain?!?? He had referred to this nagging problem of Muslim integration on 14 June 2014. It bemuses me as to why Western men and women are so up in arms about the rights and plight of Muslim women. There's no denying that the integrity, equity and propriety of women of all faiths and colour and shapes require more attention than ever. Let me quote these from Femmes d'Islam (Women in Islam) by Assia Djebar, translated from French by Jean Mac Gibbon. And this book was written 55 years ago in 1961!!! For your information, David Cameron, a descendant of King William IV was born in 1966. For me, the most telling part of Assia Djebar's book is found in the first paragraph of the first chapter. In 1961 David Cameron was just a twinkle in his pater's eyes and I very much doubt if he had been told this little story by his nanny !!!!!! ..... or even got any inkling of such a book or such a subject when in 1988, he graduated First Class in PPE at Oxford !!!!!!! But, finally, let us indulge Cameron's angst about Muslim women in UK - and ask what the future holds for them. What is the "right" and the "wrong'' of their future status ? "Showing off. A woman crosses the road wearing a skimpy outfit on Birmingham's Broad Street." From Mirror Online 1 January 2016. What about this one? Hmmmm .... not good enough. That burka doesn't fit into our culture. 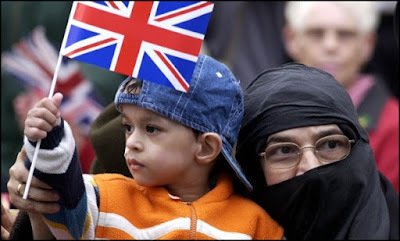 Maybe this is the ideal non-white, non-Christian British citizen. From AsH's posting of 6 years ago. Now that's our cuppa tea!!! !